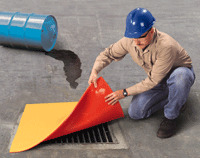 Keeps Spills Out of Drains - The drain cover has the weight and flexibility to seal off drains and keep unwanted liquids out. Durable, Reusable and Long-Lasting - Flexible 100% polyurethane construction resists water, oil and many chemicals. Can be reused - rinse with soap and water. Three Sizes - Fits Most Drains - Available as 36", 42" or 48" square. To ensure a safe and proper fit, select a drain cover that overlaps your drain opening by 3" on each side.